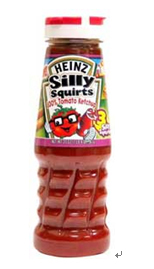 China Packaging Network compiled: Heinz, Pittsburgh, Pennsylvania, USA launched Heinz Silly Squirts fresh tomato sauce package. The special feature is that its cap includes three flip cap nozzles. The bottle body is designed to be easy to hold. Can be used in a variety of ways, sucking or dipping out tomato sauce. This design is very attractive in the United States very popular with housewives and children. Ketchup is a popular seasoning in the United States.